On-loan Ross County forward Davis Keillor-Dunn collected Zak Rudden's back heel and curled it low round goalkeeper Ryan Scully from 14 yards. Dunfermline's Bruce Anderson had a first-half penalty saved by Harry Burgoyne. Lee Ashcroft hit a post after the break with a header, then Anderson's poked effort rebounded back off the crossbar. Dunfermline Athletic manager Stevie Crawford: "It's a difficult one for us to take because we had enough chances to win the game. Falkirk have come and done a job on us. "I'll never rule fourth place out if it's mathematically possible. We've got three big games coming up." Falkirk manager Ray McKinnon: "It's a big derby game and we're delighted with three points. 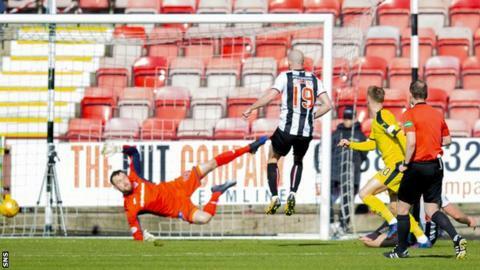 Just previous to the goal, Dunfermline had missed a couple of chances. "Sometimes in football you need to carry a bit of luck alongside your energy and quality. We just looked at each other and thought this has to be our day." Goal! Dunfermline Athletic 0, Falkirk 1. Davis Keillor-Dunn (Falkirk) right footed shot from the right side of the box to the centre of the goal following a fast break.